It is unnoticeable how fast paced the fashion industry can be. Within one skype session with my best friend today, I had missed two major fashion shows that I would usually be caught streaming online and going through an emotional turmoil when those 10 to 15 paradisal minutes are up. However, we were too busy reminiscing how amazing the first season of Gossip Girl's soundtrack was along with laughing over this hilarious video on how to pronounce Prada. Lenny was the first to remember, "Oh my god, Nina. We missed it. Oh my god! We missed them BOTH!". All laughters suddenly died down and turned into unexpected shock as we realised we had forgotten why we were having the skype session in the first place; to watch the live release of Prada and Ferragamo's SS 2015 Men's collection. We then mournfully looked for the photo uploads of the show on Style.com. Partially because we missed it and also at how just a single item of clothing from the collection could cover several months of my rent. But it never really mattered to me how expensive even the simplest and smallest items are, it's how the designers put them all together so precisely that fascinated me. Afterwards, we continued making more Prada pronunciation jokes (seriously though, that video is priceless). I look up to fashion blogs, tumblr, fashion magazines and more recently, online fashion shows as sources of inspiration and also upcoming trends or styles that I might be interested to incorporate into my daily wear. This does affect me when I go shopping for clothes, I wonder how "in season" this dress is then reminding myself to just buy it if I like it, trend or no trend because fashion is supposed to be fun. These photos were taken during an afternoon stroll around Meanwood. I wore my oversized blazer as I thought the tutu midi might make me look like a 15 year old but looking at these photos, now I just look like a small figure about to be engulfed by a blazer. The neighbourhood was so picturesque, I felt like the only thing missing was some Sinatra playing in the background. Actually, I recall one bungalow with a large open garden playing Summer Wind. This could of all been in my head though, knowing myself. I'm planning on changing my blog template so if you see random puzzle pieces that don't fit together, that's just temporary until I develop better html skills (not any time soon). Also! Do follow me on instagram (@ninaaneko) and comment down below your instagram name, I'd love to follow you back and get to know more fashion bloggers through instagram. Photo credits to KaRoz (thanks Ka!). love the mix of girly and strong. Nothing is too much, everything looks wonderfully put together. 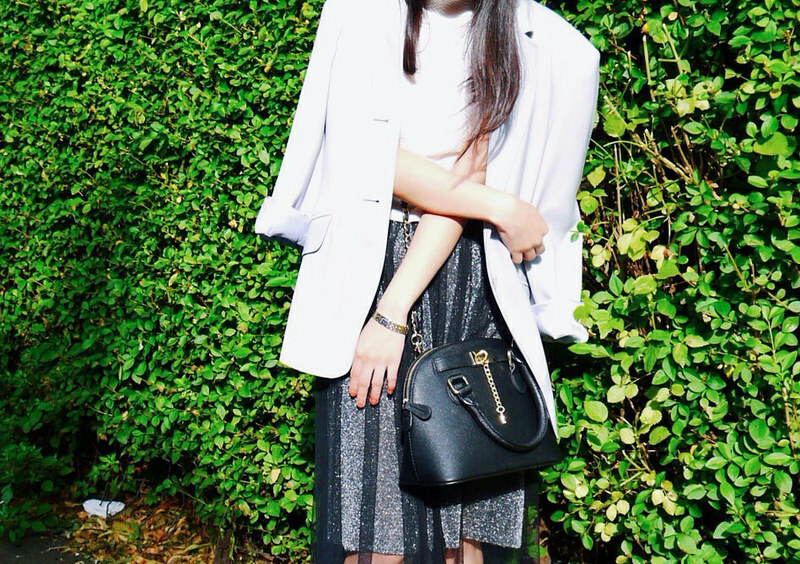 Lovely post, i have a fashion blog too, if you want we can follow each other, just let me know. Love the outfit, you look so gorgeous! Amazing skirt Miss!So trendy! I have a similar H&M one! I like the transparent layer on yours. What a cute skirt! I have a gray one kind of like it! I love this outfit, simply stylish, elegant and fresh. 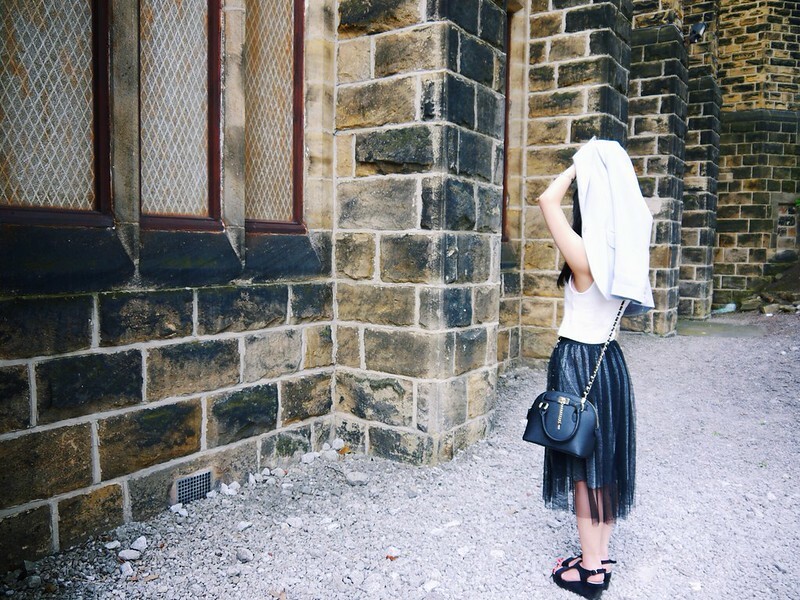 Adore the skirt and how you've styled it! Ooooo that skirt is awesome! Amazing look, love the classic colour scheme. The skirt is really pretty. Lovely outfit and i do love your bag. You have an amazing blog, would you like to follow each other on gfc and bloglovin? Great style. Love the skirt! Love the skirt & bag! I can hear Sinatra singing somewhere behind you :) A very nice post, as your midi tulle skirt. fancy skirt!! i love the tulle fabric!!! so elegant! This outfit is incredible, the femininity of the skirt works so well with the more masculine shoes and bag! You're so right that even if the clothes in the fashion shows are ridiculously expensive, they still serve as good inspiration for our own wardrobes.. plus they're super fun to watch! ;) Have a lovely weekend! Beautiful watch and this outfit is comfy but very pretty! wow this outfit is sooooo cool! i just love the skirt, such an awesome farbic. 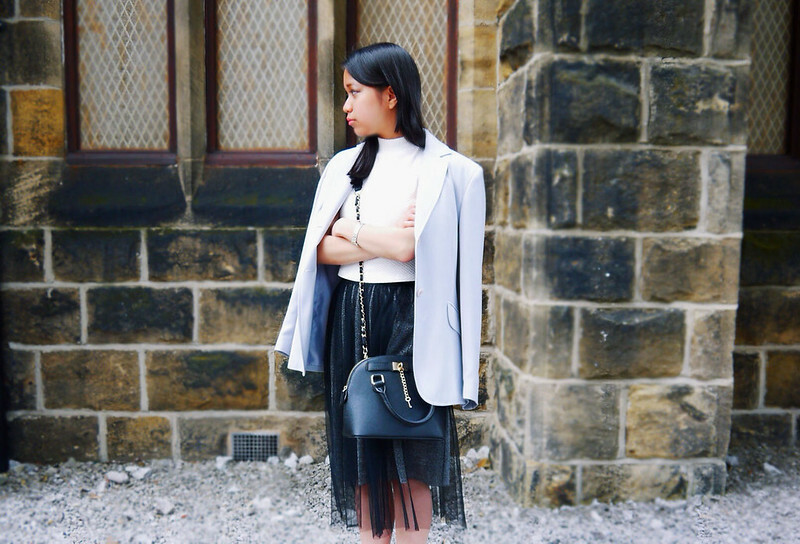 and it looks fab styled with that bag and jacket, great post! the fashion industry is really fasted paced! Such a cute outfit! I love your skirt! Just found your blog and really love it! Would you like to follow each other on GFC, facebook and bloglovin to stay in touch? Let me know, thanks!